By Joan Lewis-Heard, Community Association Attorney/Litagator; Edited by David Swedelson, Senior Partner at SwedelsonGottlieb. So, your condo or homeowners association foreclosed on an assessment lien and is unfortunately the owner of a unit or home at the association. Not what the association wanted, but a reality as a result of the Great Recession. As this situation is not untypical for landlords, it is dealt with by the California Civil Code. For the purposes of this discussion and issue, the former owner is considered a tenant as the association is now the owner. Where personal property remains on the premises/in the unit after a tenancy has terminated and the premises/unit has been vacated by the tenant, the association must give written notice to the tenant/former owner and to any other person the Association reasonably believes to be the owner of the property. Before you can dispose of abandoned property, you are required to send notice to potential owners. California Civil Code sections 1984 and 1985 provide the language that should be used in residential tenancies. You can ask your attorney to provide you with a form notice or you can find one online. Generally, the notice identifies the property, informs tenants and other possible owners and secured creditors that they have 18 days (if notice is sent by mail) to claim the property and describes how the property will be disposed of after the notice period. You can either keep the property onsite or move it to a storage facility, but you are responsible for keeping it reasonably safe until you dispose of it by auction or otherwise. The notice must generally describe the property, so an inventory is necessary. The notice must advise that reasonable costs of storage may be charged before the property is returned, where the property may be claimed, and the date before which the claim must be made. The date specified in the notice shall be a date not less than 15 days after the notice is personally delivered or, if mailed, not less than 18 days after the notice is deposited in the mail. The notice shall be personally delivered or sent by first-class mail to the former owner/tenant’s last known address and, if there is reason to believe that the notice sent to that address will not be received by that person, also to any other address known to the Association where the person may reasonably be expected to receive the notice. If the notice is sent by mail to the former tenant/owner, one copy should be sent to the premises vacated by the tenant. In some situations, the association does not know where the former owner is, has no forwarding address and, in the event the former owner is deceased, will not know of any next of kin. While this makes giving notice complicated, notice still has to be sent. Just send the notice to the last known address anyhow and there should be a proof of service kept with the association’s copy. That means that whoever mails the letter will create a document that says that on a certain date they mailed the attached letter dated ____ to the tenant at the unit address. This may come in handy if someone comes along and claims that the association did not give notice. The association must leave the property in the vacated premises/unit or place it in a place of safekeeping until the association either releases the property (if claimed or until the sale) or completes this process. While the association must exercise reasonable care in storing the property, it is not liable for any loss not caused by its deliberate or negligent act. If the personal property is not claimed, it must be sold at public sale by competitive bidding, unless the Association reasonably believes that the total resale value of the property not released is less than seven hundred dollars ($700). If it is believed to be of a value of less than $700, the association may throw it away, or use it, and need not go through the public sale. The Association can bid on the property at the public sale. Notice of the time and place of the public sale shall be given by publication once a week for two successive weeks. Two publications in a newspaper published at least once a week with at least five days intervening between the respective publication dates are sufficient. The period of notice commences upon the first day of publication and terminates at the end of the fourteenth day, including therein the first day. The notice must be published in a newspaper of general circulation published in the county where the sale is to be held. The last publication shall be not less than five days before the sale is to be held. The notice of the sale cannot be published before the last day for the tenant/former owner to claim the property (i.e within the 18 days after the notice to claim property has been mailed). The notice of the sale must describe the property to be sold in a manner reasonably adequate to permit the owner of the property to identify it (i.e. “all of the personal property remaining on the premises located at 12345 Abandoned Boulevard, Unit 999, City, California 90000, including …. (giving a general description of the property)”. The association is relieved from liability for selling any property at public sale that has been adequately described in the public notice. This requires that a brief inventory be made. If a locked safe, for instance, is on the premises, the association does not have to open it to describe its contents, but can just reference that the property to be sold includes a safe. The proceeds of the sale cannot be kept by the Association. The proceeds, after deduction of the costs of storage, advertising, and sale, must be turned over to the County Treasurer within 30 days of the sale. As you can see, the process is not simple. There are personal property auction services that will take care of the details for the association. 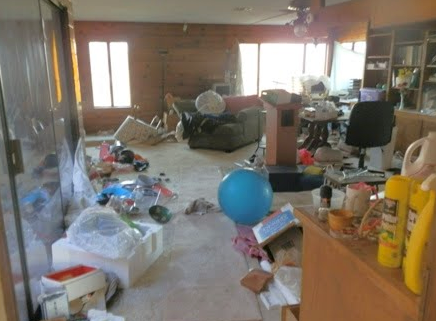 While we have not personally dealt with a personal property auctioneer, we have spoken with J. Michaels Auctions. You may wish to visit their web site at www.jmichaelsauction.com or search the web for an auction service, in the event that the Association determines that the remaining personal property exceeds $700 in value.